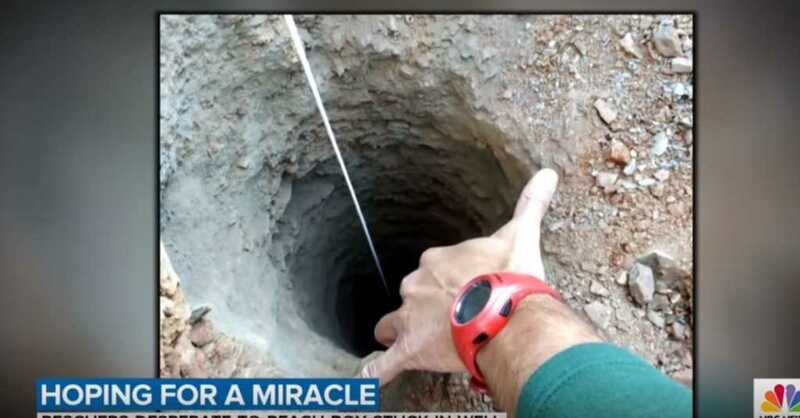 Rescue teams in Spain are becoming increasingly desperate to locate a young boy who fell down a well some eight days ago. Julen Rosello, 2, is believed to have fallen 30 stories down the borehole after wandering off from his parents during a picnic. But despite the frantic efforts of rescue crews to drill down and retrieve the child, they have not yet managed to locate him. Workers reportedly hit granite while drilling, hampering further efforts to reach the boy. Roughly 100 firefighters have been deployed to help retrieve the youngster, who fell down the hole as he and his family took a walk through a private estate in Totalan, Málaga. The opening is just 25 centimeters wide, and crews have found that about 75 meters down there is a blockage that they currently cannot get past. According to reports, a camera lowered down to try and locate the boy could not even fit through the tight gap. The images beamed back did, however, help them to locate candy the boy was holding when he fell, and also discovered hair in the soil that matched Julen’s DNA. Still, that is no consolation for Julen’s parents, who are enduring a living nightmare as they hope and pray for news of their little boy. As for the rescue team, they have assured the family that they will continue to work on the assumption that the young man is still alive. Experts are split, however, highlighting that it is unlikely the boy has survived the fall, but the adverse weather conditions might be of benefit to him. On Tuesday, a specialist mining team was flown in to assist in the rescue mission. Residents of the local town have been holding vigils as they await news of the stricken child. Others have taken to social media to offer their prayers and support. Can’t stop thinking about little #JulenRosello in Spain. Do pray for dear Julen and his distraught family at this horrific time.